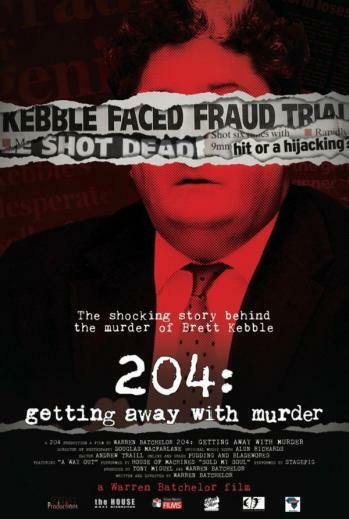 204: Getting Away with Murder is a docudrama that unearths the shocking story behind the murder of Brett Kebble. The title is a little clunky, but don't let it deter you, 204: Getting Away with Murder is an absorbing, gritty, pulpy and layered documentary. To clear things up a bit, '204' means a full and permanent indemnity from prosecution in exchange for truthful testimony, which is what was afforded to many key individuals in the wake of Brett Kebble's demise. The documentary sets about profiling the characters, organisations, financial climate and events leading up to Kebble's death, and then picks apart the questionable legal proceedings and unresolved matters in the aftermath. This is a classic rise-and-fall story about a charismatic South African businessman, whose life ended in a hail of bullets in Johannesburg in 2005. Just like the Oscar Pistorius trial, some true stories are stranger than fiction and if it does nothing else, the documentary demonstrates the potential for a Hollywood film somewhere between the dark comedy and true stories behind The Wolf of Wall Street and Pain & Gain. Was it a failed hijacking, assisted suicide or murder even? By interviewing three self-confessed killers, as well as Jackie Selebi, Glen Agliotti, Piet Byleveld, and the Kebble family, we're able to get a clearer picture of what actually happened from key players and first-hand accounts. Financial analysts, journalists and biographers weigh in on Kebble's tremendous influence and dire financial situation, his enemies and the conditions surrounding his demise, offering their take as director Warren Batchelor builds his case. Yet, Kebble's mysterious murder is only the beginning as motives are explored and a trail of money, fraud and corruption lead us to the highest level. This gritty, hard-hitting documentary has been treated like a mystery thriller with cinematic flair and enough remarkable interview characters to keep us transfixed on the swirling tale. The production is absorbing, entertaining and eye-opening as the film-makers gather momentum lacing vivid news storytelling, informative talking heads and convincing dramatisation together. 204: Getting Away with Murder moves at a quick pace, despite clocking in at 110 minutes, splicing news paper clippings and photographic evidence together without shying away. The elusive truth is what drives Batchelor and us as we drill down with an intimate set of one-on-one interviews with most of the involved parties, including: Mikey Schultz and Nigel McGurk. What 204: Getting Away with Murder lacks in finesse and consistency, it makes up for in steely-eyed determination, raw passion and sleazy, underground grit. It burns brightly enough to generate renewed interest in this buried court case, shining a light on white collar crime, the South African legal system with its entertaining blend of hard-hitting news and crime story flair.